I spent a long time dabbling in meditation, trying to teach myself from various data points I picked up in yoga classes, books and videos. And like most people who teach themselves, I wasn’t ever able to get a consistent practice up and running. I would meditate in different ways from day to day, depending on how I felt, and if there was ever any deviation in my normal schedule, I likely wouldn’t meditate at all. Some days I would sit straight, while others I would lie down. MEDITATING UNCOMFORTABLY ON A ROCK IN JOSHUA TREE, CALIFORNIA. Having stiff hips always made sitting with my legs crossed severely uncomfortable after a few minutes, so I would usually just give up or finish early. When I heard my yoga teacher say there is no correct way to meditate, it brought a sense of frustration. “If meditation was so good for you, why was it so hard to do?” I would wonder. It seemed as if monks were the only people able to meditate long enough and consistently enough to get any real benefit from it. In 2003, I met someone who invited me to a talk on meditation with his meditation teacher. After years of frustration I figured I had nothing to lose by attending. I had no way of knowing how much that night would change the course of my life. I met the teacher and he introduced me to Vedic Meditation, a style of meditation that had existed for over 5,000 years, that was specifically designed for householders (non-monks). I asked him to teach me the meditation, which was a process of learning that lasted for about four days. And almost over night, I noticed a drastic and positive difference in the quality of my meditations. The practice no longer felt hard to do. There was no more sitting uncomfortably or trying to control my mind—that approach was discouraged by my teacher. Instead, I was taught how to sit with comfortable back support, and let my mind roam free. To assist in the experience, I was assigned an individual mantra by my teacher and shown how to properly experience it to settle my own mind, without guidance, music, white noise machines, ear plugs, or anything digital or artificial. Although I had never before used a mantra in this way, it worked like a charm. Four or five minutes into my meditation, I went from thinking surface thoughts, to feeling like I was dreaming, to losing awareness completely. I would come out 20 minutes later feeling like the entire experience only lasted ten minutes, yet also feeling like I had just slept for three hours. Speaking of sleep, my night-time sleep got ten times deeper. Other changes I noticed included getting sick less often and having tons more energy and stamina when I went to the gym. I began craving better quality foods as well as higher quality company. This was the first time in my life where I felt a tangible difference in my state of being, from the inside out. And the only thing I was doing differently was my twice-daily meditation practice. I also realized from my own direct experience that people who claim there is no right way to meditate have likely never meditated in this way before. I was so hooked that I began volunteering to help my teacher as he trained other people to meditate. In fact, I encouraged all of my friends and my family to learn meditation with my teacher. At that point, my teacher had personally taught over 15,000 people in the world to meditate. Yet, he never advertised. Mostly because all of the people he taught couldn’t keep their mouth shut about how wonderful and beneficial his teaching was. Many of my closest friends came to learn, and enjoyed their experiences. My Mom even flew out from Alabama to learn. She had just gotten a divorce after 32 years of marriage to my Dad, and for her, learning this technique during that very emotional time was a Godsend. The more I practiced the technique, the easier it became, and the more convinced I was that this meditation was single-handedly responsible for boosting my happiness, productivity and creativity. 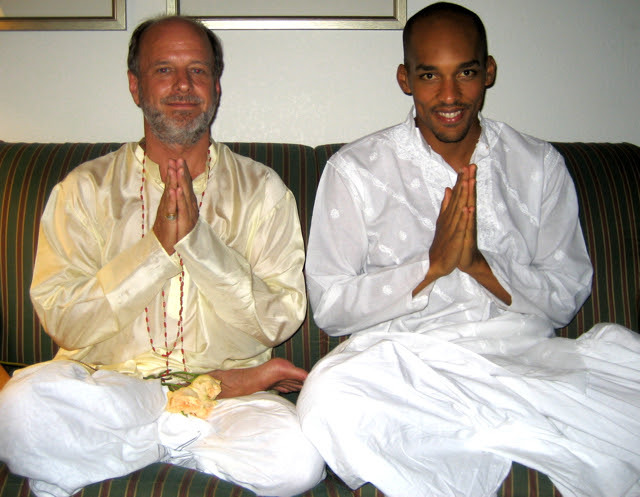 Then a few years later, I was invited to accompany my teacher and some of his other protégés to India, to be trained in the ancient ways of teaching others how to meditate. This was the opportunity I had been waiting for since the first night I met him. I dropped everything and went to study with my teacher for many months. After returning to Los Angeles, I began teaching a few people week to week out of my little one bedroom apartment in West Hollywood. To my astonishment, everyone I taught was having the same experiences I enjoyed as a new meditator, which gave me the confidence and enthusiasm to continue teaching more people. Then my friends on the East coast begged me to fly out there and teach them. I was so excited about finding my passion and sharing it with as many people as possible that I went without hesitation. Then more people kept hearing about me from their friends and wanted to learn. Now, more than 10 years later, I’ve personally taught more than 2,000 people from all walks of life personally to meditate all over the world, and thousands more online. I’ve never felt more fulfilled in my life, because I’m now able to help people access a place inside of themselves known in India as “Turiya,” which is the Sanskrit term for the fourth state of consciousness—also known to be the source of happiness. Several of my students have used their daily meditation practice to overcome PTSD, hypertension, sleep deprivation, anxiety, depression, and even cancer. I still have yet to teach someone who didn’t feel by the end of the training that they could meditate in a self-sufficient way. I still teach public and private meditation courses throughout the country, and retreats around the world. I’ve also written books on happiness and meditation, and I speak on those topics around the world. Finally, I’m the founder of an inspirational variety show called The Shine, and I write a daily inspirational email called The Daily Dose of Inspiration.